Football, Basketball, Baseball – 1948-1951. Haslett High School – 1955-1962. Lansing Eastern High School – 1963-1964. Won three MIAA Championships – 1967, 1968, 1970. MIAA Coach of the Year – 1967. Michigan State University (Defensive Coordinator) – 1971, 1972. Michigan State University (Head Coach) – 1973-1975. Big Ten Coach of the Year – 1974. Bowling Green State University – 1977-1985. Won two MAC Championships – 1982, 1985. MAC Coach of the Year – 1982, 1985. San Diego State University – 1986-1988. Won WAC Championship – 1986. 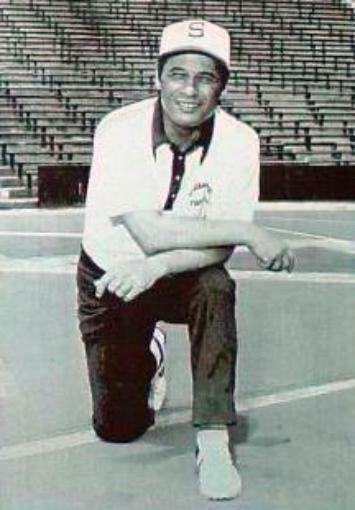 WAC Coach of the Year – 1986. Overall college head coaching record – 125-93-2.